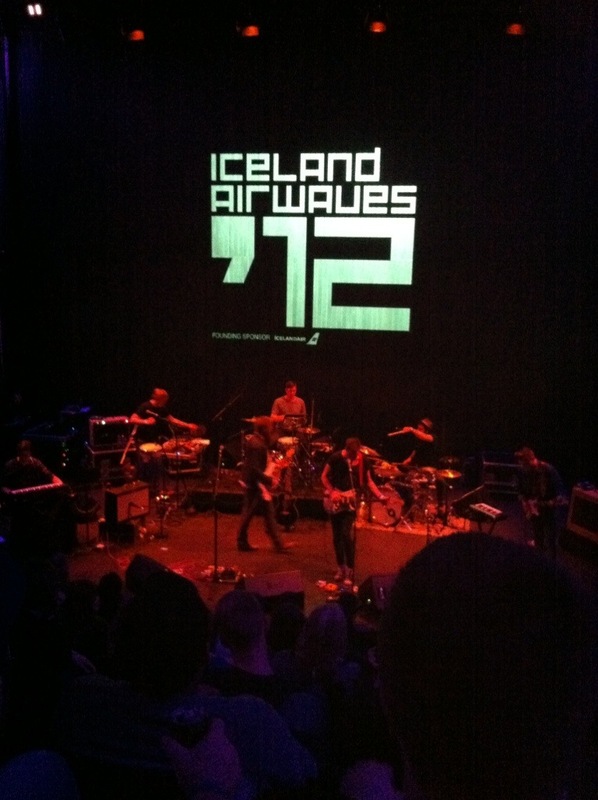 So Iceland Airwaves is over for another year. Concerts have been performed in all manner of venues, musicians have played their hearts out, Christmas brew has been drunk, emergency pylsur consumed, and the weather was a bit breezy at times. What follows is a roundup of the best Icelandic artists that played across the festival this year. Sóley is Sóley Stefánsdóttir, a twenty something girl from Reykjavík. She has the correct credentials; she learnt classical piano from an early age, before moving onto big band, brass and then composition. She cut her musical teeth whilst in Seabear, finding that her voice was something more than just something to use when doing the dishes. We Sink, Sóley’s debut album was released to critical acclaim, nominated for various awards, and is an album that I keep returning to, even a year after its release. At the Inspired by Iceland eldhús stage, her songs benefit from the intimate space, in a way that her Art Museum show earlier in the week struggled with. New song ‘Wedding’ deserves further investigation. Despite the cold, I enjoy Sóley’s short set and I’m pleased I managed to catch her at her best, before she becomes huge. In the confines of one of Harpa’s smaller yet beautiful halls, I found local boy Snorri Helgason, replete with band and grand piano. Snorri really shines, debuting new songs and playing some of his gorgeous Winter Sun album. His band also shines through, although ukulele player and vocalist Silla very nearly steals the show. In fact, one the last number, she does just that. Snorri treats us to ‘River’ and ‘Caroline Knows’ with hushed appreciation from the crowd, and delicious harmonization from Silla. Last year, Snorri and crew played 14 shows at Airwaves and the practice clearly paid off. Ólafur Arnalds is younger than me. And so much more talented. It makes me sick. Ólafur produces a strain of music that is unique and original. It mixes neo-classicism with electronica and ambient. It’s unique and intriguing. At only 25 years of age, Ólafur has released numerous albums, including Found Songs and Living Room Songs, which were released track by track over his own social media. He has toured with Sigur Rós, worked with Amiina, Jóhan Jóhansson and even dance evil genius Aphex Twin. Ólafur played an extraordinary set at Kex Hostel on Friday; the audience sat on the floor and listened to Ólafur work his magic in hushed awe. On Thursday, I braved the wind and sea spray to get to Harpa for local heroes Of Monsters and Men. You may have heard of them. All eight of them arrive on stage in a blaze of color and glitter, and here, it all makes much more sense. The lyrics sound less glib than on record and the lackluster songs on the album spring to life. By the end of the show, it feels like we are all in the band, and I’m sorry to step out into the bitter wind. A fine show. If on Friday The Eclectic Moniker, a Danish rock/calypso band started the party, local band FM Belfast took the idea and ran with it. They came over as a cross between Scissor Sisters and an old school rave. No intelligence is required here, just a pair of dancing feet. Rap battles are undertaken, a Happy Mondays style Bez character, glitter guns and stripping down to their underwear prove that this is a pure party band. They might have just have got everyone here dancing. If not, they finish with the unofficial Airwaves anthem of ‘I don’t want to go to sleep either‘ Just to make sure. Pascal Pinon are one of those bands that I’ve somehow missed. I saw them at Eldhús, and despite a shortened set, they impress me so much that I follow them to their next concert in Mánabar, where they play a full set of delightful, slightly kooky Icelandic pop. Pascal Pinon are twins who have been playing music together since they were fourteen. Their second album, Twosomeness, was released in Iceland this week. The story goes that Rökkurró formed in a Reykjavík attic space, and had to play quietly so as not to disturb the neighbors. True or not, their sound is soft and gentle, topped by Hildur’s distinctive voice. Perfect for a Saturday morning, they played a truly delicious acoustic set at Nordic House. The headliners might have just proven that the rest of Airwaves was just a warm up. Classics such as ‘Hoppípolla’ and ‘Glósoli’ got a hearing, as well as the now traditional set closer of ‘Popplagið.’ The band played for around two hours, which is substantially longer than their recent shows, which may of been a mark of respect to their home crowd. The first four tracks were performed from within a gigantic box of screens, on to which myriad projections were made, including a spooky Scandinavian forest, huge skulls and gas-masked figures that looked not unlike Gonzo from The Muppets. The screens came down to reveal an embellished Sigur Rós line up; there is a brass and string section, additional musicians, and an army of lights and projectors. There was a danger that the fantastic light shows and projections may have threatened to take some of the emphasis away from the music itself, and a small part of me was pleased to when a box showing the error message ‘no signal’ momentarily flashed up on the giant screen. I needn’t have worried though, a startling performance of ‘svefn-g-englar’ showed the power of music and visual effects working together. The best is yet to come. Sigur Rós played a new song in their encore, and what a beast it was. Called ‘Brennistein,’ it starts with a bass line that sounds like a science-fiction creature searching for prey, it’s a juggernaut of a song with an attention catching first half, and a delicious, thoughtful finish. It sounds like a song from a movie that plays in your head, and this might just be the best song I’ve heard at Airwaves this year. Sigur Rós then, have delivered a headline show that was of top quality and pushed the rest of Airwaves brusquely aside. The best performer though, may not have been a band or artist at all, but the brief appearance of the northern lights on Thursday night. It was certainly a thrill to see the bright streaks of green above the Art Museum and it was at that exact point that I knew I’d definitely be at Iceland Airwaves ’13. This entry was tagged airwaves, aurora, breezy, Iceland, northern lights. Bookmark the permalink.